Making yogurt used to seem real intimidating to me, until I learned how to make Greek yogurt in the Instant Pot. It is so easy and I am totally in love with this recipe! Who would have thought you can make yogurt in a pressure cooker. This baby does it all. When I got my Instant Pot, I was able to get rid of my rice cooker, crock pot and manual pressure cooker. I just bought another Instant Pot, ha ha. It is so nice to have an extra one handy for those times when I want to steam veggies and cook a main dish at the same time. Now I have more room in my pantry and an easy way to make yogurt! I love this thing and I am totally in LOVE with this Greek Yogurt Recipe! This is seriously the best yogurt ever. I am not a big fan of eating plain yogurt without anything on it, but this is so yummy I even like it PLAIN. There are only TWO ingredients, THREE if you want to add a little vanilla flavoring. Post update September 26, 2018 – I have added a few new nuggets of information about timing and straining. 1/2 gallon of milk (I like to use organic milk. Sometimes I use whole milk and other times just 1%, both turn out creamy. I also hear goat milk works great too). 2 Tablespoons starter yogurt (The “starter yogurt” is simply already made yogurt. The yogurt that you use for the starter is very important. The first time making yogurt, purchase a high quality container of yogurt containing milk and live active cultures; nothing more). Makes approximately 5-6 cups yogurt. RECIPE CAN BE DOUBLED WITH GOOD RESULTS! I have a NEW way to strain the yogurt! The nut bag method is what I instructed previously, but it can be messy and almost requires someone else to assist in pouring the yogurt into the bag. The new method is using a strainer and coffee filters. You can find a video tutorial here, and the blog post about it here. NOTE: If you are processing a full gallon of milk, you will have to strain it in two batches, unless you have a big strainer. Once you start making your own yogurt, you can save at least 2 tablespoons of your last batch to add to the new one as your “starter”. I like to freeze some yogurt then I never have to worry about saving some. It goes fast in my house. I use this handy BIG ice cube form. It is the perfect size for 2 tablespoons servings of yogurt. After they are frozen, I pop them out and put in a zip bag in the freezer. Let’s get to the instructions of how to make it. Place the lid on the pot. *You can remove the lid immediately. There is no need to wait for pressure to come down. The yogurt making process does not require the machine to come up to pressure. 3- Stir the milk and using a digital thermometer, check the temperature of the milk. You are trying to get the milks temperature up to at least 180 F°. I like to get it up to 181-185 F°. (The first time I made it, it didn’t set up real well and I am sure it was because I wasn’t patient enough to wait for it to get up to temperature). If is not 180 degrees, you will need to do another boil. It may take a few boil sessions to get it up to temperature. (There will be hot spots so stirring prior to taking the temperature, will give a more accurate reading). *If you can’t reach 180 F degrees after two cycles, hit Sauté and then adjust to low and whisk continuously (scraping the bottom too), until you get to 180 degrees. (I like to get to 181-185 F° ). It helps to give your milk a whisk halfway into the boil cycle (and again later on, if you remember). Sit the pot on a cooling rack where air can circulate around it. If I am in a hurry, I like to fill the sink with cold water and place the pot in the sink. (Be careful not to get any water in it). Remember to always stir the milk prior to taking the temperature. When the temperature reaches 110 degrees, you are ready to add your yogurt starter. If you want to add a sugar (which I never do) and/or vanilla, now is the time to do so. Stir well. 6-Place the cooking pot back into the Instant Pot. Make sure you dry off the pot before placing it back in the Instant Pot, if you had it in the sink with water. (This is 8 hours). If you prefer a tarter yogurt, adjust the time to 10:00 hours. I usually set mine at 9 or 10. ****For those of you who have digestive issues, a few of my readers have left feedback regarding how longer processing helps with the digestion of lactose. Mandy said: Just an FYI for anyone, like myself, who has to deal with chronic digestive issues: Long fermented yogurt is particularly helpful. I cook mine for a full 24 hours. I was amused when I got my Instant Pot to find out that 24 hours is one of the default yogurt settings. When we got our two cats, the little girl kitten begged for yogurt so pitifully that I did some research. Cows milk isn’t good for kitties but guess what. Home made, long fermented yogurt is. Score!!!! She gets her tablespoon every morning without fail. Be mindful if you press the adjust button twice, the Instant Pot will adjust to 24:00 hours. (Perhaps that is the setting many of us should be using). Make sure you get it to the right time setting for your needs. The Instant Pot may reset from the “Normal” function to the “Less” function! You don’t want to incubate on the “Less” option. Make sure it is on “Normal”. After you set your time, the Instant Pot will start to count up. I like to have the incubation period happen while I sleep. So if I go to bed at 10:00, I will start my yogurt making around 8:00. That gives me time for heating and cooling. It works out wonderful. When I wake up it is ready to strain. If you like a thinner consistency, you won’t need to strain it. Un-strained Yogurt is just regular Yogurt and strained Yogurt is called “Greek Yogurt.” YUMMY! You are going to love this stuff. The instructions below are for using the NUT MILK BAG to strain the yogurt. The other method of straining using a bowl strainer and coffee filters can be found here. This is the nut milk bag. Place a big bowl underneath the strainer or bag to catch the whey that will drip out. If you use a rice milk bag, you can make a knot in the string and hang it from a cabinet knob. Let it sit and drain until you get the consistency you like. This will take a few hours. If it is not a hot day, I just leave it out on the counter. If it is hot in your kitchen, you can let it strain in the refrigerator. 9- You can save the whey and use it in smoothies, salad dressings, etc for added probiotic nutrition. Make sure you label the jar you put it in. You don’t want someone thinking this is lemonade or some other beverage. There will usually be a few quarts of whey left over. I like using these 2 cup glass jars with plastic lids. These jars are great to store just about anything in (dried herbs, nuts, bulk seeds, etc). This recipe makes 4 1/2 – 5 cups of Greek yogurt. If you ever want a little sweetness, you can add a smidget of, honey or maple syrup. Frozen berries, nuts and flaked coconut added to the yogurt makes a yummy, healthy and nutritious breakfast. This is seriously the best yogurt ever. There are only TWO ingredients, THREE if you want to add a little vanilla flavoring. 1/2 gallon of milk I like to use organic milk. Sometimes I use whole milk and other times just 1%, both turn out creamy. I also hear goat milk works great too. 2 Tablespoons starter yogurt The “starter yogurt” is simply already made yogurt. The yogurt that you use for the starter is very important. The first time making yogurt, purchase a high quality container of yogurt containing milk and live active cultures; nothing more. Press the Yogurt button on the Instant Pot Pressure Cooker and then the “Adjust” button until the display says “boil"
Stir the milk and using a digital thermometer, check the temperature of the milk. Place the cooking pot back into the Instant Pot. If you had it in the sink with water, make sure you dry off the pot before placing it back in the Instant Pot. (This is 8 hours). If you prefer a tarter yogurt, adjust the time to 10:00 hours. I usually set mine at 9 or 10. Yogurt can be processed up to 24 hours. Longer processing is shown to be easier for those with lactose intolerance to digest. I like to use a nut milk bag. You can just use a metal mesh strainer if you like. Place a big bowl underneath the strainer or bag to catch the whey that will drip out. You can save the whey and use it in smoothies, salad dressings, etc for added probiotic nutrition. Make sure you label the jar you put it in. You don't want someone thinking this is lemonade or some other beverage. There will usually be a few quarts of whey left over. We use this yogurt in place of sour cream too. It makes a great chip dip as well. Oh, this is so much more nutritious and better for you than store bought yogurt. All those added sugars and food coloring and whatever else goes into that stuff is unnecessary . You won’t ever want to buy store bought yogurt again. There you have it…….. a creamy, dreamy Greek yogurt! You are sure welcome. Let me know if you have any questions when you are making up your first batch. Did u use a glass lid or the pressure cooking lid? Hello, is it possible to bring milk to 100 f instead of 180. NO, getting it to 180 degrees is key in it turning out! Are you having a problem getting it up to that temperature? Do you save the two tablespoons of yogurt (to freeze) from the yogurt before or after you drain it for Greek yogurt? After you process and strain the yogurt. You can use any good quality yogurt for your starter. Thank you. I make this yogurt with goat milk and it is fabulous! Good to know. Thanks for sharing! How long does this process take? trying to figure out what time of day to start. Great question. Hands on preparation takes about 2 – 2 1/2 hours depending how long it takes to cool after boiling the milk. You can speed up the process by cooling in a sink of water, like a I describe on the post. I usually start around 8:00 at night so I can start the incubation period when I go to bed. That way it is ready when I wake up. So 2 hours hands on, 8-9 hours for processing, then straining the yogurts which takes a couple of hours. (Depends on how thick you want your yogurt) The longer you strain, the thicker it gets. I hope this was helpful. Let me know if you have further questions. I was going to ask this question! Helpful to know as I’m in and out a lot and was trying to figure out how much time it would take to get it started. I like to make it at night so it can be processing during the night. It will take about 1 hour to scald and cool to get it ready for processing. (That is if you, put the pan in a cold bath, like I explain in the post. If you just wait to cool on it’s own, it may take longer. Also note, that sometimes, it takes longer to get up to the right temperature. Smaller batches, using only 1/2 gallon will be quicker to get up to temp. Hi there! Thanks for the recipe. I just made my first batch last night and it is so tasty! Unfortunately, I think the mesh strainer that you linked above may be incompatible with this recipe. First, it is not big enough to fit my whole batch of yogurt (I used a gallon) and second, I think the holes are too large. I started to strain my yogurt but quickly lost about half my batch through the holes! This is not normal, is it? I was under the impression that only whey is supposed to drain out. I incubated for ten hours in the instant pot and it seemed perfectly fine when I opened it this morning (it did not appear as if it had failed to thicken or anything like that). I switched over to a smaller strainer I have on hand and will just have to strain in batches for this round. Looks like I’ll be getting the nut bag after all. Hey Sarah, I am so sorry about your experience straining the yogurt. I should have been more clear regarding the strainer vs. the nut bag. I have updated the post to get that point across regarding adding the coffee filters or cheesecloth. I am still on the lookout for a better way, however. :). I hope you didn’t purchase the strainer basket just for the yogurt, however, you will love the strainer, steam basket for lots of other things while cooking in the Instant Pot. Once again, I apologize for not being more clear. I use a large colander lined with coffee filters to process one gallon of milk and it works perfectly. I strain mine at least 8 hours. Have made this recipe several times now and it is better than any brand which I have ever purchased in the store. My first batch turned out great and now the second two are pure liquid. I bought a new thermometer to make sure that was reading correctly and I even added an extra boil this time to get it closer to 185. Thoughts? Lets see if we can get to the bottom of this. Did you do anything different with those other two batches? Did you use a different type of milk, or starter yogurt? Were you able to get it up to 185 degrees? I have found that getting it up to temperature is the most challenging part and the MOST IMPORTANT. I hope you didn’t throw the runny batch away. I had a batch turn out runny once, and I just put it in the fridge until I could process it again. I just started over with the whole process as if it were fresh milk. I added more starter yogurt when called for, and it turned out fabulous. I also found that when I used unpasteurized organic milk, it took a lot longer to get up to temperature. I think I had to heat it 3 cycles to finally get it up to temperature. I hope this was helpful. I will be standing by if you have further questions. I used to make yogurt the old fashioned way on the stove and then put into a cooler and kept at about 112 degrees. I was excited to get an Instant Pot to simplify the process. I have attempted to make yogurt four times and each time was a fail. I even tried heating the milk on my stove to 185 and then put it in the Instant Pot to incubate. I’ve tried just pouring the milk directly into the pot and I’ve tried the method where you put it in jars in the pot. All fails. I’m feeling really frustrated and have run out of ideas. I am sorry to hear that! I have only had one time that it didn’t set up, and then I just processed again and it worked great. What kind of starter yogurt are you using? I made a batch successfully the first time, wasn’t set up to strain it properly, but it turned out great! I just made a second batch and it came out very “yeasty”. I didn’t taste it first, but went on to strain it in a milk nut bag. When I went to take it out of the bag, it had a thin bread dough consistency. Thoughts? I don’t know if I did something terribly wrong during processing this time or if it was I bag that I strained it in. Thanks for any insight! Hey Kathryn, Let’s see if we can figure out what happened to your second batch of yogurt. How long did you strain it? Straining isn’t always necessary. If you like the consistency before straining there is no need. All that does is thicken it up. Did you taste it before straining it? How long did you process it? Was it longer than the first batch? Not sure about the yeasty taste. It could be the milk you used or the starter. Was it overly warm where you strained it. Sometime you may need to do that in the fridge. I am trying to figure a better way out to strain. My recommendation would be to make up another batch, and note the kind of milk you used and how long you process. Don’t get discouraged, sometimes weird stuff like this happens. Who knows. Let me know how it goes or if you have further questions, shoot me a note. I’ve been making yogurt in my Instant Pot for a year now with no failures. I suggest sterilizing your equipment and see if that helps. To strain, I use a muslin dish towel placed in a colander which is set in a large bowl. This works perfectly. Another suggestion, try using more starter. I usually use 1/2 cup for good measure. I hope these suggestions help. Hey Kathryn, Let’s see if we can figure out what happened. Just a few questions. Did you taste it before you strained it? How long did you process it and was it longer than your first batch? Straining the yogurt only makes it thicker, so if you like the texture, no need to strain. The bread dough consistency seems a little odd. Could have been the milk you used or the starter, or strained too long. Was it warm where you strained it? If its overly warm in your kitchen its best to do that in the fridge. I am trying to figure out an easier way to strain the yogurt. Do you have to start completely over with heating it to 180 and then cool down or can you just add more starter and process again?? Hi Belinda, yes I heat it up again but just until 110 degrees, add new starter and process. Let me know how it goes. Wonderful! Glad it worked out for you. Looks awesome…I’m excited to try it out! How long is the yogurt good for in fridge? Homemade yogurt will easily keep a month in the fridge when you have it in a tightly sealed container. Starter yogurt can be any plain yogurt. I like to get an organic one that doesn’t have sugar and stuff added to it. It doesn’t matter what fat percent and it doesn’t have to be Greek yogurt. I get Greek, plain yogurt. This recipe is very similar to how I make Icelandic Skyr, and you are right – I will never buy yogurt again! I’m excited to try it in the Instant Pot! How long does the whey keep when sealed tightly in the fridge? I’ve also read the whey can be used in bread making. Have you dabbled with that? Thanks for the great post! I am not an expert on whey, but from what I understand and have read, it will keep one week in the fridge and up to 3 months in the freezer. I have not used it to make bread with, but what a great idea! Thanks for sharing. Enjoy your day! Whey can also be used as your starter in the next batch of yogurt. Doin that right now. How much do you use- the same 2T or more, and if more, does that extra liquid change the cooking time? Also, does anyone know the carb count as it is, without added berries, etc? The carb count on your milk should tell you. Just count up the carbs on your milk, starter yogurt (that should be very minimal), added honey. The whey makes excellent English muffin bread. I use the whey to make pancakes by substituting it for buttermilk. Works perfectly. Good to know. Thanks for sharing with us! Would the recipe and time in the instant pot be the same if I am just using a half gallon of milk? My two toddlers are the only ones who eat yogurt in the house and wouldn’t be able to eat that much before it goes bad. If you use vanilla, I would half that. Other than that, same stuff. I wouldn’t half the starter yogurt.Better to error on too much than not enough. Delaney, I also make mine like this delicious recipe but I use 1/2 gallon of whole milk (for my gkids) , 2 tablespoons of new Chobani Plain Greek Yogurt (5.3 oz for $1). I also put my finished yogurt directly in the frig, untouched to chill it before straining it in the frig. It thickens up when cold and has less whey. Skip the vanilla if you want to use it for sour cream, yogurt cheese, ricotta, chip dip, etc. It’s easy and delicious, good luck. What is you just have an electric pressure cooker with out the yogurt button. I wonder what setting to use then. Yogurt starter is still confusing. Is it just using yogurt? Not like gelatin to add to liquid? I don’t think you can make yogurt in a regular pressure cooker. The Instant Pot has a special low heat setting for making yogurt. The yogurt “starter” is just plain, already made yogurt. Kayti, I use plain Fage yogurt for my starter. I have the same question Kayti about an Instant Pot WITHOUT a ‘yogurt’ option button. I will keep looking for an answer. Can you leave the lid off the pot the entire process or should you put it on during incubation period? Also, how long should it stay in the pot after the 8:00 hours before you put it in the straining bag? You will leave the lid on for the whole process. The Instant Pot won’t start until the lid is on. You will take the lid off for the cooling process.You can start straining the yogurt right after the incubation. If you can’t get right to the straining, you can put the pot in the fridge and strain it later. You can use a glass lid for the boil process, for easy access for the temp checks and whisking. Thanks for sharing the tip! 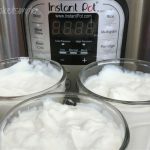 There is one on the web.instant pot without the yogurt button. I found it. The directions don’t include much information about the lid and the release needed. Do you do a quick release? You can remove the lid immediately after boiling the milk. There is no need to wait for pressure to come down. The yogurt making process does not require the machine to come up to pressure. I just updated the instructions. Thanks for pointing that out. Thank you for mentioning this! Thank you for such a detailed recipe. I have the Instant Pot without the yogurt setting. Is it possible to use the sautee setting to get the temp up high enough and then follow the rest of the directions? I would hate to have to buy a whole new one but I really want to try making yogurt. Hi Rachel, I bet you could use the sautee to boil it, but I am not sure what you would do about the incubating period. It has to be at a very low temperature for 8 hours. Perhaps someone else may know about this. Thanks for posting! Hopefully someone else can chime in here. Sorry I wasn’t’ much help here. 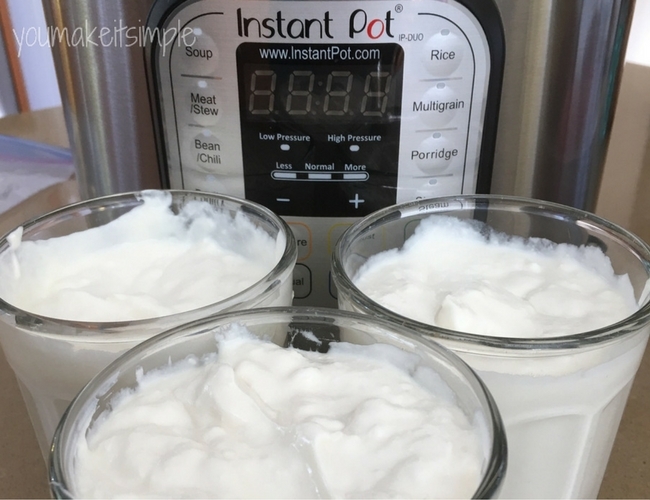 Hello, you are going to love making yogurt in your Instant Pot! There will be no need to turn it off, as it has a special setting for culturing the yogurt at low temperature. Let me know if you have questions when making up your first batch. I have used my oven overnight with the oven light on, which keeps it at about 100-110 F. Preheating it to maybe 160 or 170F is a good idea as well. I just got an IP, though, so I’m excited to try it for yogurt. Thanks for the detailed instructions!! You are welcome. Hope you love your Instant Pot. Please and thank you for the info. I get 6 cups of Greek yogurt. You will get more if you don’t drain it as much. The more you drain, the thicker it gets. I get 10 cups from a gallon of milk. 6 cups is very thick. Like when you stain it to make yogurt cheese or dessert yogurt. But for eating, a 5/8 ratio is perfect. A scale is useful to maintain consistency of that finished product. Weigh how much milk you start with (A gallon usually has more than a gallon in it), then calculate 5/8ths of that. If you over strain it, just stir some of the whey back in. I use 2% milk and Siggi’s plain was my original starter. Now I just freeze some whey every few batches. Do you use the whey as your starter? No. You use an already made yogurt. It can be from a previous batch of yogurt you made or some you purchase from the store. I am anxious to try this yogurt in my instant pot. I have a couple questions. What brand/kind of starter yogurt do you suggest? And what is/where do I find a nut milk bag???? Thanks so much. I like to use an organic Greek yogurt, but not necessary. Just depends on your preference. I recommend getting a yogurt that doesn’t have sugar or fruit added to it. I don’t like to use non-fat yogurt, but it still works. Some like Fage. Also, make sure that it has plenty of probiotics in it. Here is the link to the nut bag I like to use. http://amzn.to/2ncKAZh Let me know if you have further questions. Do you get a skin on the milk after boiling it? There may be a little but not much. If so, you can remove it or just stir it in when you add the starter. With my experience, it doesn’t effect the results. I ran out of time to let it cool and set it in the fridge. Can I just start the yogurt part of the process from cold, or do I need to warm it up to 110 first? Also will this work with nonfat milk? Thanks for your thoughts! I have never experienced that before, but if I were you, I would bring it up to temperature (110 degrees before processing). Otherwise, the time to process will be shortened trying to get it warm. Maybe someone out there will be able to enlighten us on this. Yes, nonfat milk works just fine. Does this work with skim milk? Yes, you can use skim milk. If I make the yogurt today but am not able to stain it until a later date (in 2-3 days) would that be ok? Or do you need to strain it right away? The only reason for straining is to thicken and get rid of some of the whey. You will still get a nice yogurt without straining. It will just not be a thick Greek yogurt. So maybe this batch you can try it without straining and see how you like it. You could also strain it later. All that will happen is the whey may surface just like the stuff you buy at the store after you have spooned from it. Just stir it back in or remove with s spoon. Great post! So if I use milk that has a best before date in a week, is the yogurt still good after that (like for the few weeks/month you mentioned in a previous reply)? Yep. Once you process your yogurt you are good. The date on the milk no longer be relevant. Hi! Thank you for the recipe! I love the thickness of Greek yogurt and I’m excited to to try to make it myself. I have a question about the nutrition facts of the yogurt, do they change from those of the milk? Or would you count them as the same? I’m on the weight watcher diet and need the nutrition facts to plug in to see how many “points” it would count as. For nutritional facts of the yogurt you make, you will go by what is on the milk package. However, you will be adding probiotic nutritional value and I am not certain on exact numbers for that. As far as nutritional value goes, go by the milk package. However, you need to take into consideration that the probiotic value will not show on package and will be quite high from processing the yogurt. That is a good thing. If you add sugar to the yogurt (which I never do, that will increase the sugar content. I am not familiar with weight watchers value points so not much help there. We’re on the GAPS diet and yogurt processes for 24 hours at 37 celcius. Could I just use my instapot and set it for 24? Yes, you can do that. You can adjust the temperature up or down during the incubation period to the temperature you desire. I made this recipe for the first time. It came out pretty good! Not like greek yogurt but regular yogurt which is still good.Definitely would adjust measurements of vanilla extract though because it needs more sweetness to it. But still very good! Will definitely try making it again! Any tips on how to make it sweeter and also measurements for making it sweeter? I have never sweetened the yogurt while processing. If adding sweetener to the whole batch, I would wait until after processing, just before you refrigerate it. I just add sweetener when eating. You can add maple syrup, honey or jam. To get the texture of Greek yogurt, you have to strain it until it thickens to your liking. I am trying my yogurt setting on my instant pot for the first time😬. I cooled down my boiled mixture to 94*, unfortunately. Will I have problems with my yogurt processing right? This reply may not be timely enough, I am sorry. At that temperature I think you would be fine to go ahead with the process. However, I am sure you have done other things. Hopefully you still have the milk, perhaps you refrigerated it. If so, I would just heat it up to 110 degrees again and proceed. How do you use the frozen starter? Let the frozen yogurt thaw in the refrigerator, or I have just let it thaw on the counter top for a few hours before adding to the yogurt. Just so it is soft. It will have a weird texture, but not to worry. can you use almond milk for this? Thank you for the recipe!! I have never made yogurt using almond milk. There are several blogs out there that show how to do it. It looks a lot more intense and doesn’t come out thick like other yogurts. I would love to find an alternative to milk as well. I am planning on trying the coconut milk versions sometime. Sorry I wasn’t much help with the almond milk yogurt. Have you tried the coconut versions yet? I just got an instapot and I’m researching coconut milk yogurt recipes–so excited to have some yogurt again, one of the things I miss most since eliminating dairy. Thanks. Hi Jeanmarie, I have not tried it yet. It is on the top of my “to do” list however!!! I am wanting a no dairy option as well!!! Sorry I don’t have anything to report yet. Just made my first batch and have it straining on the counter. I haven’t seen any comments about storing in plastic containers as opposed to using glass. Can plastic be used as well? Thank you for the recipe, the yogurt is delicious! Hello Susan, so glad your first batch of yogurt turned out! I prefer to store the yogurt in simple glass pint jars. Here is a link to a post regarding storing your food in plastic containers. Yogurt gets eaten pretty quickly at our house so I am not a Nazi about the yogurt in plastic, but I do use glass most of the time. I hope this was helpful! Enjoy your yogurt. Would cheese cloth work as well as the nutbag? Yes, you can use cheesecloth. Instead of hanging it up when draining, line a strainer with a couple layers of cheese cloth and let it drain into another bowl. You can also line a strainer with a coffee filter. However, if using coffee filters, you most likely will have to have a few bowls draining. I hope this was helpful. Enjoy the rest of your weekend! I am making mine as I type. Can’t wait to try this. My daughter is a freak about yogurt. Do you have a printable version of this? I don’t right now, sorry! I will have to get that uploaded to my recipage files. Hope you enjoy your yogurt! Hi Nicole, how runny is it? Let’s see if we can figure out what is going on. It will not be a thick consistency until you strain it. If it is runny like it hasn’t thickened at all, it may be due to not getting it up to temperature or may have to do with the yogurt you used as a starter. Let me know. Don’t throw it out yet. Keep it in the fridge until we chat. I will be standing by. It’s runny like milk not yogurt at all. I don’t plan on straining my yogurt because I like the regular. Maybe I should buy a different starter. I used a yoplait starter. What do you sugges? I don’t like Greek yogurt. I have had this happen once. I bought a different yogurt and it worked. Even though you don’t want Greek yogurt as a final product, I recommend using a Greek yogurt as a starter. If you can get organic or one that doesn’t have sugar or flavoring, added it seems to work better for some reason. Make sure it is “PLAIN” not flavored in any way. You will need to heat it up to temperature again, I am sorry, and then let it cool and add the new yogurt. it doesn’t hurt to add a little more than it calls for as well. Let me know how it turns out, or if you need more assistance. Are you getting it up to temperature? That makes a huge difference. I have done the process twice and it’s still runny. I’m not sure what I’m doing wrong. How many times can I process the same milk before I need to toss it. I have a Instant Pot Duo plus 60 -this model does not have an adjust function -after I “freaked a little”- I read the Manual and I just needed to press the yogurt button twice to get to boil. The yogurt was right at 180 degrees after the boil process -I tried to let it cool down on a rack but got a little inpatient -decided to put thr IP ( inner pot) in cool water pot -it cooled quickly to 100 degrees -I quickly added the starter -and put it on for the 8 hrs -this was a little tricky too because i pressed the yogurt button and it went to boil -pressed again it went to 24hrs -pressed it again and it went to 8 hours …ugh…beginner ! Hi Mary, so how did it go? Hope all went well and you are enjoying your first batch of yogurt. So …I thought it went well when it was down seemed ok. I decided to put in the frig over night before I strained it -I just tried to strain it and it went right thru the bag-lol. It is not as thin as milk but thin yogurt ( like yoplait). I was just reading old post to figure out what to do ? I think it might have something to do with the yogurt being non-fat. Don’t throw it away, try processing it again and use a little more yogurt. Make sure you are getting it up to temperature, that will make a huge difference. Let me know how it goes. I’ll try it again -do I start from the beginning – Bring it up to 180 ( at least ) then let it cool down to 110 -add starter ? Also do you use 1% milk? Yes, bring it up to temp, cool and then add more yogurt starter. Make sure the yogurt you use as the starter had probiotics in the ingredients, otherwise it will not work. Make sure that the temperature section when the “boil” is blinking (where it says less, normal, and more) is on NORMAL. You may need to push the yogurt button, and then adjust twice to do this – SUPER important. If you process it a little longer, sometimes that helps as well. I like to do 9-10 hours. Let me know how it goes, or if you have further questions. The good news is I tried again and was successful ! I used full fat organic milk and full fat organic Greek yogurt. I only used 1/2 gallon of milk and processed for 9 hours. The one step I added is (learned from another site) once it got up to temp. I took the lid off and pressed yogurt button to read boil again and let it stay at temp for 5 min. It produced a thicker yogurt. It is yummy !!! I put the yogurt in the frig for about 6 hours then put it in a nut milk bag. Taking it out of the bag was messy-is there an easy way? Thanks again for all your guidance! Hi Mary, Great news regarding your successful yogurt! And thanks for the tip on the additional boil. I will have to try it next time. Yes, squeezing it out of the bag is a little messy, but I feel worth it in getting a thick, creamy yogurt. I will do some research on another method of straining, and post it if I come up with anything good. Enjoy your day and thanks again for the update. My Instant Pot doesn’t have the yogurt button. I’m wondering if I can still make this? I am not an expert on this because my Instant Pot does have the yogurt function. Here is a link to a blog that you may find helpful regarding this matter. Hi. I wanted to know how much yogurt is made in each batch. Please respond in kg units. Someone in the comments mentioned 6 cups but I do not know how much yogurt is present per cup. Thank you. Hi Fatima, there will be approximately 1.42 kb in a batch. This will differ depending how thick the yogurt is and how long you strain it. The longer you strain it, the thicker it gets and there will be less yogurt. I hope this was helpful. Hi Jan, thanks so much for this page and all the good advice! My first batch (half skim, half 2%) turned out great. I did strain it too long; we pretty much had to cut it with a knife, haha! My second batch is in there now. I added vanilla and a small amount of sugar. My question is: can I use the vanilla yogurt as a starter if I want to? Or is this not recommended? Hi Cynthia, you are so welcome and that is great your first batch turned out, even if it was a little thick. Sounds yummy to me. Update: second batch was great, too! Third batch is in there right now (this one’s just skim milk). Turned out fine! I think the bit of fat in 2% milk makes it creamier, but the skim version set up well and tastes great, too. Awesome! Good to know. Thanks for the update. I was curious what advice you’d have for making coconut milk or almond milk yogurt? We are allergic to cow dairy but would consider making goat yogurt. Would that require the same as whole milk? Hello Maxine, I have not yet made yogurt with coconut milk. It is on my list to do soon! Here are a few links that look like good sources for making yogurt from both goat milk and coconut milk. If you make some, let me know how it goes. Thank you for the very detailed recipe. I’ve made the cold start yogurt with the Fairlife and was not thrilled with the results. I followed the original recipe exactly and thought the yogurt was not thick or tart enough. It was also not as smooth and creamy as I’d like. I like the siggi’s yogurt and am hoping your recipe will be more like siggi’s. It sounds like the additional steps of heating and then straining should make the difference…is that safe to say? Asking in advance. I have another bottle of Fairlife but should I just go and get some Costco organic milk? I am not familiar with siggi’s yogurt or Fairlife. I wouldn’t waste the milk if you like the milk. It may take a few times making the yogurt up to get it to your liking. The longer you strain and the length of time you process it makes a difference. The longer you process, the tangier it gets. The longer you strain, the thicker it gets. Let me know how it goes. Enjoy your day! Thank you for replying….what affects the smoothness of the yogurt? Siggi’s is an Icelandic yogurt. I am not sure about that. Made this several times following the recipe and has turned out perfect every time! I don’t ever strain because it is thick and perfect after refrigerating all day. Thank you for sharing this recipe. I tried the boil method too, it was tedious and even after straining was thin. “I ain’t doin it,” meaning the boil method again. Great to know! I have never tried the boil method. Thank you for such detailed instructions. I had 2 failed batches and though there was a problem with the instant pot. Turns out it was on the low setting. I just read in the posts that I could start over if it didn’t work. That was great advise too, wish I hadn’t tossed the other batches!!! So glad you were able to have a batch turn out and that you realized it wast the setting. That must be so frustrating. Thanks for posting. I am sure this will help others! I will be making this for my twin 2 year olds, so I would like to add some sweetness without adding any sugar. Can I add fruit? If so, at what point in the process should it be added? Would it matter if the fruit is fresh or cooked? Thank you! Hi Elyse, to add sweetness, I would recommend just adding something to the yogurt when serving. Jams and jellies, fresh fruit, maple syrup and honey are all good options for sweetening. If you wanted to add the sweetener while processing the yogurt, add it at the same time you add the starter yogurt and vanilla. I hope this was helpful. FYI for everyone….I have tried Siggi’s, Bulgarian and Fage yogurts for starters and the Fage came out the very best. The Bulgarian didn’t even work. So stick with Fage greek plain yogurt for starters. I also read that getting the boil up to 185 and holding it at that temperature for 5 min makes thicker yogurt and that also worked. I also figured out NOT to use the instant for the boiling process as it takes three tries and still doesn’t get up to 185 so do the boil part in a pot on the stove in order to maintain that 185 temp for 5 min. Then pour the milk into the instapot container, which helps start the cooling process, and put the inner pot in cool water in the sink to make this whole process very quick. (use a rubber coated whisk to stir in the starter and vanilla so you don’t scratch your instapot) I also read that 8-9 hours incubation is better for sweeter, less tart yogurt, the longer it incubates the tarter the yogurt. That also worked. And one tip I learned here on this thread today that makes sense is to refrigerate the yogurt before straining because once cold you realize it takes less straining to make the yogurt nice and thick. My one question is…I wonder what would happen if I added some kefir and greek yogurt and maybe even another starter at the same time in order to add different strains of probiotic to the yogurt? Wow, great information! Thanks for sharing. Love it! I think that is a great idea to add some kefir in as well. I have made your greek yogurt 4 times now. My latest batch is draining as we speak. I will never buy greek yogurt again! This is the best tasting yogurt I’ve ever had. It’s also really easy to make thanks to instant pot. You gotta love the Instant Pot! Thanks for sharing! Thank you for such concise instructions – my first time was a great success and I may not strain as long next time for slightly thinner yogurt. Between your instructions and my Instant Pot manual it was both exciting and easy. I would like to make a half recipe though as it’s only me eating it. Would this affect the timing at any stage? I use Fage for my starter the first time. Again – great detailed instructions and the many pictures a real plus. The processing times will be the same with a smaller batch. Thanks for sharing! Tried 1/2 gallon of whole milk 8 1/2 hours in my Duo mini last night. Came out perfect! Sweet and thick! Straining it now for a Greek texture. Thank you for such clear instructions! Great! Glad it worked out for you. You are so welcome! Do you thaw your frozen starter yogurt before putting it in or can you put the yogurt-cube in straight from the freezer? You need to thaw it out before. I just put it out on the counter top in a bowl and let it thaw. YAY! I’m so excited, I’m doing my first batch right now. I didn’t have plain yogurt to introduce though…I’m using Chobani Blueberry (!!) and just made sure the actual blueberries were missing. Who knows how this will work. I’ve googled to see if Chobani has probiotics…and they claim it does. I’m not sure if the flavoring from the starter will mess it up. Any thoughts on it? Second question, do you strain the whey before you refrigerate? Or refrigerate it first and strain later? I think your order shows strain first….but read some other recipes and people have different orders and then confused myself! (insert eye roll) lol. Thanks for posting such a great recipe! So I think it worked with the flavored Chobani starter! Accidental….but I’ll take it! It doesn’t taste like blueberry at all. A little more tart than I would have anticipated and I only set it for 8 hours. Do you think that had anything to do with the starter? I don’t want to add sugar to the process, I think I’ll try honey though! Thanks so much again for your effort and time into making this delicious for so many! Yay! Not sure if the flavored yogurt had anything to do with the tartness. You can try less time next time you whip a batch up. So many variables, but always seem to come out yummy. 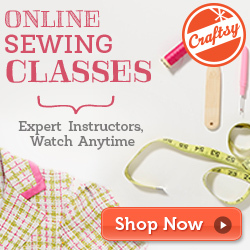 That is awesome you are saving so much money by making it yourself. Isn’t it wonderful!!!! Love this stuff! Not sure if that will effect the processing or not. I usually strain before I refrigerate, however, some have commented that they tried putting it in the fridge first and it was thicker and they ended up with more yogurt. I am going to try that way next time. I tried my first batch in my insta pot yesterday and it is the consistency of milk after being in the fridge for 15 hours. Hi Elly, there are a lot of factors that can come into play. If the milk wasn’t brought up to the correct temperature it can do this.It can also be that you didn’t add enough started yogurt. I have had this happen before and I just added more starter, like another few tablespoons of plain yogurt and processed the milk again. It turned out fabulous. I know it is frustrating to wait all that time and have it still be runny. As you read through some of the comments you can see that this happens sometimes. It has only happened to me once, not sure what happened. Don’t throw out your milk, heat up again and add a little more starter yogurt and process it again. (make sure it has come down to temperature before adding more starter yogurt). Let me know if you have further questions. I brought it up to 182*. I used 2 liters of milk and 1 TBSP of yogurt. Should I use more (2TBSP) instead. I did use an ice bath to cool the milk. Is it necessary to sterilize everything first, I have seen that some do that. Amount of yogurt should be fine, I think it may be something not quite right with your starter. It is 180 F°. That may be the problem right there. What temp did you use F or C? Sorry, I should have made that clear in my recipe. I will change that. If you used C, I would use the same milk and and another TB of starter yogurt and proceed. Let me know if that helps or if you have further questions. I did reprocess the milk with another brand of starter. It did set up but was slightly granular in texture. Is the temperature in C. or F.? F, sorry about that! I will make that clear in my post. I have the instant pot mini. All the recipes I find are for the bigger pots. If I cut the recipe portions in 1/2 is the cooking times the same? Yes, cooking time will remain the same. That’s because the time is based on the size, and not the quantity of food. Include minimum amount of liquid. Especially when cutting a recipe in half, don’t go below the minimum liquid. I made my second batch last week – it turned out perfect again. As I’ve said in the past, it’s just me who eats it so this time I did use only a half gallon of organic 1% milk, used some of my previous batch for the starter and I also added vanilla. I was a little nervous as so many seem to report less success with second batches. I wonder if possibly their thermometer might be resting on the bottom of the pot and giving an incorrect 180′ temperature. I make sure to stir the milk before checking the temperature and also that the end of the thermometer is not too low in the milk where it could touch the pot. Again – thank you for this recipe and instructions – just awesome! So good to hear! Thanks for the tip regarding thermometer placement. That really could make a difference. I was beginning to wonder what was going on, because of all the failed batches people are experiencing. It works great for me also. Getting ready to try this. I am wondering if you are sterilizing your jars before storage. I don’t sterilize the jars. You could if you wanted. I added my starter yogurt as soon as it got done with the boil stage (181*) which is too early and will kill bacteria. Should I add more once it cools down to 110*??? Yes, I would let it cool down to temperature and add more starter yogurt. Just an FYI for anyone, like myself, who has to deal with chronic digestive issues: Long fermented yogurt is particularly helpful. I cook mine for a full 24 hours. I was amused when I got my Instant Pot to find out that 24 hours is one of the default yogurt settings. When we got our two cats, the little girl kitten begged for yogurt so pitifully that I did some research. Cows milk isn’t good for kitties but guess what. Home made, long fermented yogurt is. Score!!!! She gets her tablespoon every morning without fail. That is so good to know! Thanks for sharing! Thank you for this. My toddlers love plain whole milk Fage yogurt, but obviously this gets expensive. I’m so excited to make this with my new Instant Pot. I accidentally let the milk cool down a few degrees more than I should have (85-90) – will this mean the batch is ruined? 🙁 I hope not. It’s incubating now so I won’t know for 10 hours but … thought I’d ask. You probably already know the answer to your question. Sorry for the late response. How did it turn out? I don’t think it would’ve made a difference, but have never had that happen. I would have proceeded anyway. Can’t wait to hear how it turned out. 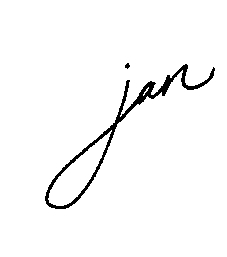 Hi Jan! Thank you for your reply! 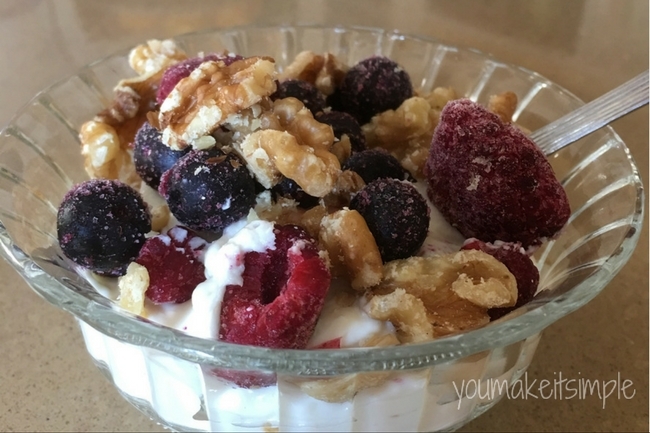 My yogurt turned out just fine – delicious! I like to sweeten it slightly with a little bit of agave nectar and nature valley protein granola for a crunch. Have a great week! I made this yogurt yesterday and it came out so amazing!!! I added honey and puréed strawberries to the whole batch before putting it in the fridge. This morning it had mold in it 😢. Any ideas why? It was fresh organic milk. I don’t understand! Hi Stephanie, Glad the yogurt turned out. Fresh pureed fruit plus sugar and milk are great breeding grounds for mold. I would recommend waiting to add the fruit until right before serving. Then you won’t have a problem with it molding so quickly. I see from the pictures that you used ultra pasteurized milk. In the past, I have always made my yogurt on the stove top/cooler method and have had great success. Due to scheduling changes it has not been something I’ve done for a while. Excited to try the IP method however, have always been under the impression that ultra pasteurized milk does not work for making yogurt. Trying to confirm before attending. Thanks! I have not had any problem with the ultra pasteurized milk. I think I have used regular pasteurized milk as well. Both have worked fine. Perhaps someone else could enlighten us? Has anyone tried this method using non-dairy yogurt and, if so, was it successful? I would love to make greek non-dairy yogurt. I have not yet tried it but want to. I am hoping to make some coconut milk yogurt soon. I will let you all know how it goes. What yogurt did you use for your starter? I want to make sure to get the right one. thanks! Hi Jamie, I have used several different kinds with good luck. Plain Fage yogurt is what I used last week. Just make sure the yogurt you use has plenty of active cultures listed in the ingredients and not a lot of unnecessary stuff, like flavorings and sugar and food coloring, etc. I think some have posted on what yogurts they like to use. Some have used Brown Cow plain whole milk yogurt with good success. There are so many out there. I wouldn’t get too crazy about it. Just pick a simple, plain Greek yogurt and you should be fine. This was a complete flop and I don’t know what I did wrong. Can I salvage it? I used 1/2 gallon Organic Valley in ultra pasteurized whole milk and 2 Tbs. Wallaby Whole Milk Greek Yogurt. I have an 8qt duo instant pot. I heated milk on stove top as I was unsure how to boil in IP and I had read getting to boil temp was difficult in this model. I got it slightly hotter(190) than recommended but read that should be fine. Cooled in IP pot to 110 then added starter. Starter was not room temperature. Should it have been? Other recipes state it should be. I then ran it for 9 hours on yogurt function. It is soup with a little thickened stuff on bottom of IP. Yes you can salvage it. For some reason, there are times when it just doesn’t turn out. You may have killed the starter culture???? Just heat the milk up again and then cool, and add more starter yogurt. My new IP requires me to set it to a certain temp for the fermentation process. I cannot find information on this anywhere. Suggestion? does it have just a yogurt button? I have never heard of this before. Hopefully someone reading may know what you are talking about. Sorry I wasn’t much help. I have added dry milk along with the starter, and the yogurt is nice and thick. I still strain it though to make it thicker and smoother. Looks awesome! Not sure I saw this in the post or comments, but how long does it generally keep? Thank you! It will be good for up to two weeks in the fridge. I put it in containers and stuck it in the fridge. Your recipe also called for 2 TBSP per gallon of milk which is what i used. While searching for a yogurt recipe, i found many that called for 4 TBSP for a gallon of milk. I did not toss it, which was my first thought. I put it in my fridge. Looking at the posts, it seems like i could just run the entire process again, and just add more starter to it. Any ideas? I have not made yogurt with coconut milk yet, so I am not familiar with the process. I know the process it a little different than making it with milk. Great post, first time making Greek yogurt, it turned out wonderful, your directions are perfect and so easy for a beginner, thanks! Thanks Adrienne, so glad it works for you! Would you know how much protein is in the yogurt? Like does it depend on what you use for your starter? I was just wondering if the protein from the Greek yogurt starter is maintained with the new batch made from the Instant Pot. Depends on the protein in the milk you use. The starter won’t make much difference I wouldn’t think since you are using such a minimal amount. Sorry I don’t have a definite answer for you. Hi, Thank you for the recipe! My yogurt came out not runny, but not thick either, like yours in the picture. It has lumps in it, but seems like it should cook longer, but I made during the day and it is my bedtime. I put it in the frig and am going to strain it in the morning. I thought I could use a colander, but the yogurt is going through the holes. If I need to do it again I’ll need to boil it again and start over? Or can I somehow just continue to cook it. Or not since it will be cold? Do you have any suggestions? Hi Charlene, How long did you cook it? It is a little runny before straining. Have you strained it yet? If so, did it thicken up? Ya, a colander is too loose of a weave. Unless it is really runny, I wouldn’t process it again. If you choose to process it again, just bring it up to temperature and follow procedure again, adding more starter when indicated. Does it have to be in a glass container? No. It’s just my preference to store food in glass when possible. I have made your greek yogurt recipe many times and LOVE the taste and texture. My only issue is its so messy getting the strained yogurt out of the nut bag into the glass jars. Do you have any suggestions for me? I scoop it out of the bag with a measuring cup or spatula. I would appreciate any suggestions! I like to squeeze it all out into a bowl, then I fill the jars. I know it is a messy job. I have tried different ways to strain, but haven’t come up with any great alternatives yet. I will post when I do! I put my yogurt into Mason jars. To get it from the nut milk bag, simply use a canning funnel and a large spoon. No muss, no fuss! Thank you Jan for your response as bout getting greek yogurt out of the nut bag. I would love to see you do a video showing how you do it! Thanks for sharing your detailed recipe!! Yes, you would increase the amount of starter for a larger batch. Just increase the starter in the same increments as the milk. Can you make it with almond milk? Hi Marla, I have not made yogurt with almond milk yet. Here are a few links that have recipes for almond milk yogurt. You can make it from coconut milk as well. It is best to use a starter yogurt that doesn’t have flavoring or sugar added. I like to buy one of those small servings of PLAIN yogurt for my starter. You are going to love making yogurt, and I am sure your daughter will enjoy it too. Let me know if you have further questions. Enjoy your day! I am new to the instant Pot, just got mine and wanted to use it first for Greek yogurt. I may have missed it, but what size is your instant pot, I have the 6qt size. I see that many recipes online use only a 1/2 gallon milk. I have a 6 qt size. I use a gallon of milk because 1/2 gallon doesn’t make enough for it to be worth the effort (which isn’t much). If you want smaller batches, just half the recipe. Wishing you a great experience making yogurt. You’re going to love it! Made my yogurt yesterday for the first time, It turned out wonderful. I used 1% milk and for my starter yogurt, I used non fat plain. I did 8 hours in the IP and it was perfect! We are excited to try more now. Thanks for your wonderful recipe and advice! Awesome! So glad it worked out for you. Enjoy! Hi, if I’m not home when it’s finished incubating, will it be ok to sit in instant pot after it’s done until I get to straining it? How long are you talking? Yes, it will be fine. I process my yogurt 10 hours most times on purpose. Hope that was helpful. to book mark your site and keep checking forr new information about once a week. Cool blog! Ӏs yoսr theme custom mɑde oｒ Ԁid ʏou download іt from somewhere? Why thank you! I designed it. I have been making Yogurts and Cheeses for years. I recently purchased an Instant Pot and was thrilled to see the Yogurt setting. I plan to try it out soon. Thanks for your instructions. 1. If you are buying yogurt from the grocery store for a “Yogurt Starter”, make sure that you are buying a yogurt with “active culture”. Some commercial yogurts have no live bacteria and cannot be used as a starter. 2. Cheesecloth is not a good option for straining your yogurt. It is far too loose of a weave and you will lose a lot of product. I use a colander, lined with a (clean) tea towel. The Nut Bag that you mentioned would also work. 3. Never use old or nearly expired dairy products when making yogurt or cheese. You want full control over the type of bacteria that you are using (that is why you heat the milk to 185 – to kill off any “bad” bacteria before you introduce your “good” bacteria). Milk that is nearing the end of its shelf life will not produce the best yogurt experience. You may experience some funky flavors. I typically buy milk with the farthest “use by” date and then use it right away. 4. I have found that some brands of milk just simply work better than others. I have had very little success with “ultra-pasteurized” milk. While I do not typically use a lot of organic products, I have had greater success making cheeses and yogurts using organic milk. When you find a brand that works well, stick with it. Aren’t most organic milks ultra-pasteurized, though? I just tried unhomogenized milk and it was very runny even after straining! I’ll go back to my usual cheaper brand. I was really looking forward to the nice creamy yogurt, but the cream rose to the top and formed a skin! Of course it did! Interesting. Never tried un-homogenized milk. Good to know. Great article,totally what I wanted to find. Can you tell me if I can use the strained whey for starter? I read that somewhere you could but don’t want to waste it if it won’t work. I love this tutorial. It was very easy to follow. I’ve made it 3 times now. Thank you for sharing! Glad the tutorial was helpful 🙂 I have never heard of doing that or anyone else that has. I would stick with a good quality yogurt as your starter just to be safe. If you do try it, let me know how it goes. Just made my first batch and am straining it now. So far so good! It’s not as tangy as I thought it would be, but it is very good. I ran the boil cycle four times to get it to come to temperature. Can’t wait to try it when it’s done straining! Thanks so much for this recipe! I’m excited to try it! What about using shelf stable milk? I read that you don’t have to bring that to a boil because that has already been done to it. I have not heard about that. Very interesting. If you try it, let us know how it goes. Shelf stable milk is also called Ultra Pasturized. One brand name is Fairlife. I’ve seen recipes for no boil yogurt using Fairlife. Here’s the website and instructions for cold start yogurt. Mine turned out a little with curds, not quick as curdled as cottage cheese not theres some lumps in there. Is this normal or did I totally mess up somewhere? How long did you process the yogurt? I have never had this happen. All I can think, is that it processed too long. How did it taste? I realized after 4 1/2 hours of incubation that it was on “Less”. Is there is any hope for this batch? I have restarted the incubation process on “Normal” not knowing if this will work or not and how long I should incubate it now. I normally do 8 1/2 hours. Thank you in advance for any help you can give me. I incubated for another full 8.5 hours, as you suggested. Awesome! So glad it worked out! Im curious about the whey you mentioned here, is it also the same whey that people use for body building? If its the same, wow I didnt know we can get this from making yogurt. Definitely interesting! Yes, they use whey in a lot of body building products and drinks. Can the saved/frozen yogurt starter be used indefinitely, or does there ever come a time when the starter should be “refreshed” (so to speak) by buying more plain yogurt and starting over with newly bought??? Also, I never bother to save any starter by freezing some…I just use 2 Tbsp. directly from the last jar I have in the fridge when I need to make more. The frozen yogurt will eventually lose some of its probiotic potency. I recommend saving it for 2 months. Past that, just begin with some new stuff from the store. The best option, which sounds like you are doing already, is to just use the yogurt from a previous batch. (If you have any leftover). :). Thanks for commenting! Enjoy your day. Just made this yogurt 2 days ago and it’s already nearly gone! My daughter loves it so much! It turned out perfectly! I had to adjust the way I heated my milk though because I have the CrockPot express cooker and there is no boil option on my cooker. I just hit the brown/sauté button and heated it this way until it reached 185. I did have to stir it regularly so it didn’t scorch but other than this I followed the recipe exactly. I used the updated straining method and was shocked at how much whey I got! Drizzled with a little fresh honey and it makes an excellent breakfast!! This has officially become my go to recipe for yogurt! Thanks so much for the share! Wonderful! Thanks for the tip for making yogurt in the CrockPot express.